Für RaceRoom Racing Experience wurde ein Update veröffentlicht, mit dem sowohl Fehler beseitigt, als auch Vorkehrungen getroffen werden, damit die nächsten neuen Inhalte reibungslos aktiviert werden können. Bevor in Kürze das Touring Classics Pack veröffentlicht wird, hat Sector3 Studios ein Update für RaceRoom Racing Experience veröffentlicht. Dieses hat sowohl auf den Servern des Rennspiels Vorkehrungen für die Nutzung der neuen Inhalte getroffen, als auch werden die Client-Versionen der Rennsimulation entsprechend präpariert. Daneben gibt es auch wieder eine ganze Reihe weiterer Verbesserungen und Fehlerbeseitigungen, die ihr anhand des nachfolgenden Changelogs im Detail sehen könnt. Zum Touring Classics Pack gibt es viele Bilder, die ihr euch nicht entgehen lassen solltet! Prepared the game for upcoming releases and sponsored competitions. Added Fanatec V2 support and default controller profiles. Added numerous additions to the Shared Memory to provide more data to 3rd party developers. Added individual controller profiles for different Fanatec rims. Implemented support so Fanatec rev-light works by default. Added a new keybinding option for Fanatec LED Display cycle in secondary functions. Added a “Random” setting to Time of Day selection. Fixed a crash that could occur with older replays. Fixed an issue where cars would randomly lose body parts while watching replays. Fixed an issue where car shadows would sometimes stop moving. Fixed so that the Vehicle Settings apply when set in pause menu. Fixed an issue with loading screen popping up one frame between title and splash screen. Fixed a crash that was occurring at the end of hillclimb tracks. Added additional logging to catch resolution related errors. Added additional logging to catch potential ffb/physics issues. Fixed an issue where the server difficulty was not matching with what was showing in-game. Fixed having 2 “Continue to Results” in pause menu in certain cases. Fixed an issue that could cause path to user documents be wrong. Fixed Player name and End of Session text not fitting the overlay. Fixed an issue where the car was moving at start if gear is engaged. Fixed AI in main path braking for cars that are slowing down while entering pitlane. Fixed a potential AI distance error for cars to the left/right on different paths. Changed default steering lock for gamepads from 13 to 8. Updated some values on all gamepad default profiles. Dedicated: Added result reports (basic version in json and xml format, additional data will be included later). Dedicated: Added options to upload reports to ftp and http. Touring Classics physics overhaul. 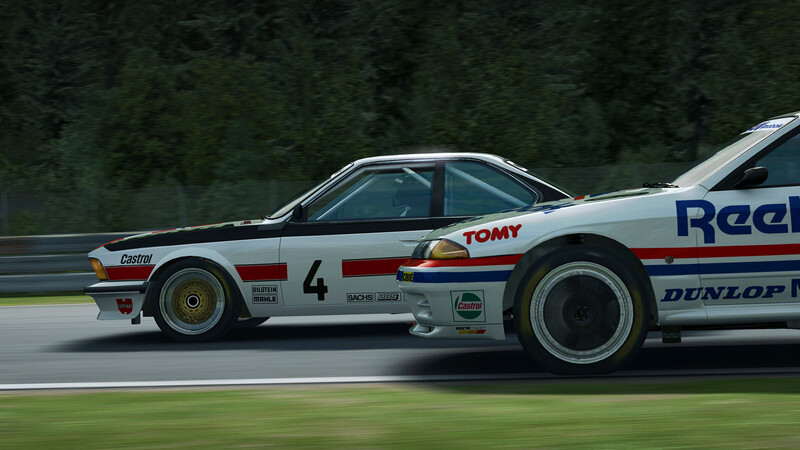 This class now matches performance with DTM 1992. Sachsenring - Fixed AI car hitting pitwall under ai control during pitstops. Sachsenring - Merged cut track rules across all difficulty levels. Reduced quantity of advertisement boards around most of the tracks, and moved some around so it all looks more like it belongs. Lakeview Hillclimb: Deleted animated 2D flags, replaced audience with some more highpolygons bodies, replaced 2D audience with new ones. Chevrolet Dekon Monza - Fixed some heavy glare on interior windows. Added VIP Drivers directory in portal which will list all the VIP drivers. Optimized login flow by removing redundant user page load before redirecting to menus. Added failover on MW timeouts. Added additional checks for store transaction fails. Fixed an issue with user content cache which was getting invalidated after adding price to a new content. Fixed discounts not being considered for second pack in the cart. Fixed an issue with user content cache which was getting invalidated after adding a a new content. Fixed an issue where some transactions were remaining pending and not getting completed. Optimized loading times for user content. Optimized loading times for web menus. Fixed a caching issue that was causing image assets not to load correctly on some browsers such as Safari.